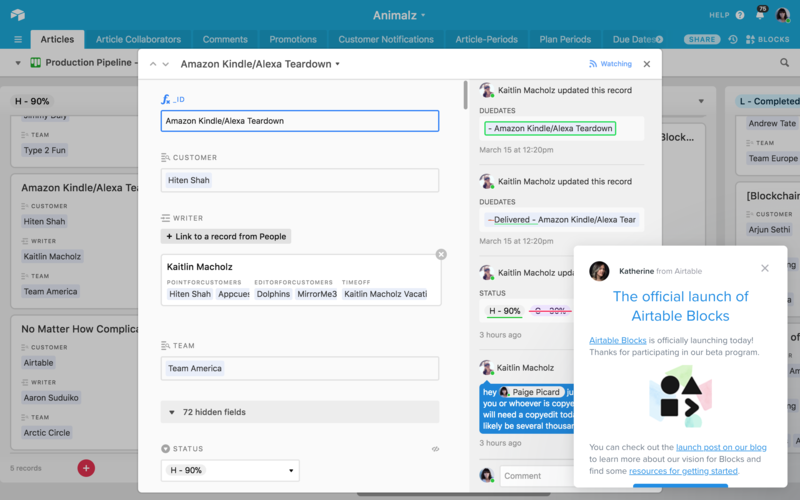 As a spreadsheet-database hybrid, Airtable offers users a powerful platform where they can organize individually or collaboratively on anything from an editorial calendar to UX research to nearly anything, really. Airtable has the capability to store tons of data for users, but up until now users didn't have the ability to see what that data might look like visually. Their newest feature release introduces Blocks, which essentially allows users to turn the data from their tables into charts and graphs. To announce this new feature, Airtable displays a subtle and friendly scroll box when users log back into their account. Using a photo and name of a real person on the new feature pop-up gives their announcement a personable feel to it and friendly tone. As users scroll through the pop-up box, they see several links to helpful resources for learning more, including a blog post, some resources to get started, and their knowledge base. The box itself isn't overloaded with information, but having three separate resources means that the information is available if a user wants to learn more. The use of the emojis as feedback at the bottom is cute and fun. 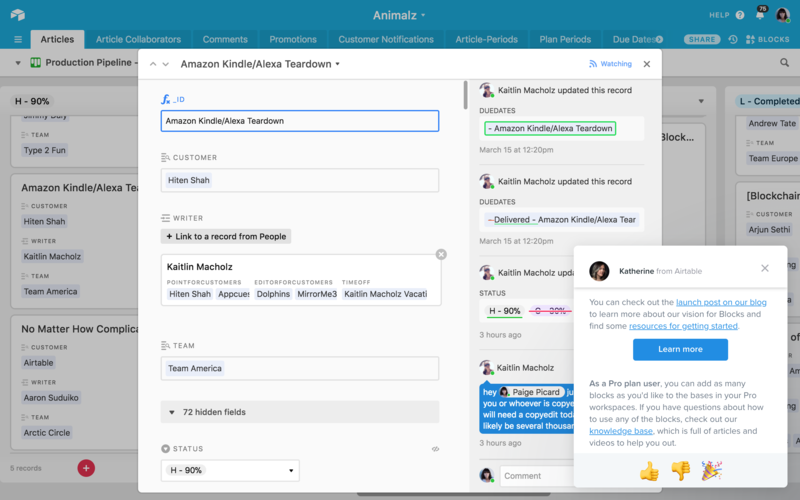 This is a clever way for Airtable to collect data on how users feel about their feature announcements, while also allowing users to weigh in with one click. YouTube Studio don't leave the upgrades they make to it, to chance. User feedback is embraced from the get-go to push the studio towards perfection. LinkedIn prompts the user to help with their personalization with a single, easy question and answer method. Sketch's incoporation of live prototyping and cloud-based collaboration into its tool in a seamless way.